Remember the movie, You’ve Got Mail? You know the one where Tom Hanks and Meg Ryan fall in love with each other after exchanging emails? Though that film hit theaters in 1998, it still demonstrates why email marketing remains one of the most important communication tools in today’s society. AOL may be obsolete, but email sure isn’t! Though small business owners may not be looking for love online, they certainly are looking for ways to connect and build relationships with their leads and customers. And if you’re not using email marketing to do that, you may be missing out on a powerful opportunity. But you may be wondering, why email marketing? Well, to answer that question, we’ve put together a list of just a few reasons why email marketing is one of the best digital marketing tactics that a small business can invest in. The number one reason why email marketing is a no-brainer for companies is because consumers prefer email. Most small businesses are working with limited marketing budgets, which means that they can’t waste time with marketing tactics that won’t resonate well with their target market. While social media has become a popular way for small businesses to communicate with their audience, brands sometimes just can’t get the organic reach they are looking for through these channels. However, social media isn’t the only answer. Email also provides a professional and direct medium that allows businesses to reach out to their leads and customers. What’s more is that most consumers actually prefer to communicate with brands through email. In fact, one study from Marketing Sherpa reports that 72% of consumers prefer to receive promotional messages through email. When it comes to business promotional content, consumers prefer to be contacted through email. It’s convenient. With access to email right on their smartphone, most consumers find this type of communication very convenient. Not only can consumers stay connected with their favorite brands wherever they are, but they can easily redeem any coupon codes or other special offers right from their phone. It’s personal. Today’s consumer is bombarded with marketing messages, and they tend to respond best to those that are personalized and relevant. With email marketing, you can personalize your messages and content based on the subscribers preferences and buying patterns. Email segmentation makes it easy to deliver the most relevant offers and content to the consumer. It’s instant. Consumers like the ability to get information about exclusive offers and last minute deals. Email marketing allows your small business to instantly and directly get the word out about these sales and promotions so that your consumers can take advantage of the opportunity to save. Now that you know why email marketing is so popular with consumers, it’s important to understand how often they prefer to receive email communications and what types of email communications you should deliver. Many studies have shown that email users prefer to receive marketing emails just once a week. This frequency allows you to communicate consistently without overwhelming your subscribers. The only way to know for sure what types of content resonate with your unique target audience is to track the success of your email marketing campaigns over time. Track metrics such as open rates, click through rates, and conversions to see which types of content your subscribers respond to best. Unsubscribe rate patterns can also help you better understand what types of content your audience is not so interested in. It’s no secret that today’s consumer has become increasingly more mobile, proving yet another reason why email marketing is ideal for reaching your customer. 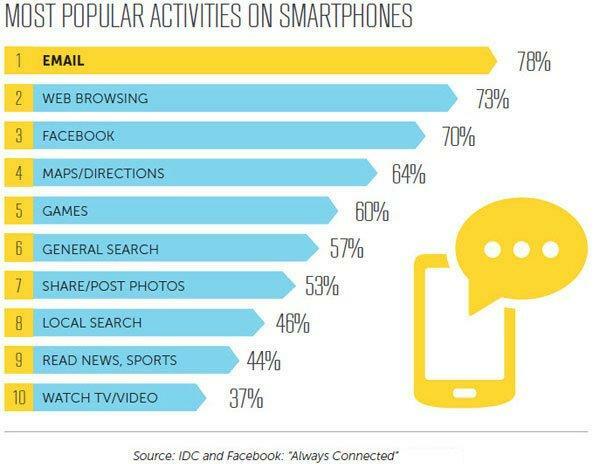 Though not all consumers shop from their smartphone, many will check their email from these devices. In fact, reading and sending emails is one of the most popular activities for smartphone users, beating out web browsing, the Facebook app, and even apps for maps or directions. Mobile device users tend to use their devices often to check their email, including marketing messages from brands like yours! The popularity of email on mobile devices makes email marketing the ideal tactic for small businesses that want to reach their mobile consumers. Unlike creating an app or SMS marketing, email marketing does not require small businesses to invest a significant amount in new technology or different types of software. In addition, email marketing allows your business to reach beyond smartphones to connect with consumers on other types of mobile devices like tablets. Now that you know why email marketing is essential for reaching mobile customers, let’s talk about optimizing your emails for these devices. 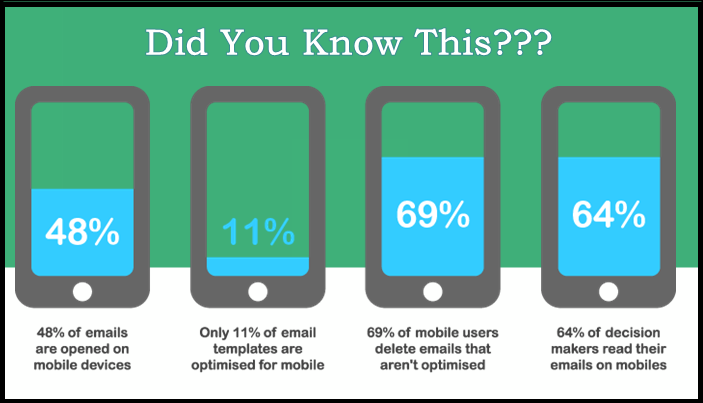 As you can see from the infographic below, 48% of emails are opened on mobile devices, and 69% of mobile users will delete emails that aren’t optimized for their device. This means that if you are not working to optimize your marketing emails for mobile then you may be missing out on the opportunity to reach these mobile consumers. If you want to get the most out of your marketing emails and know why email marketing works, then it’s vital that your email marketing content is optimized for mobile devices. Keep it simple. Use a clean and simple email design that translates well to a smaller screen. Start with a responsive template that you know subscribers will be able to read on their mobile devices. Limit your images. Images are a great way to engage your audience. However, you should be limit the amount of images in your email messages. Too many images can take a long time to load, and larger images may not be viewable on a smaller screen without excessive scrolling. Optimize your text. Not only do you need to pay attention to the images that you use in your email messages, but you will also have to be conscious about your text. You want it to be easy to read and scroll through on a smaller device screen. Make sure the message gets to the point right away and avoid using long paragraphs. Use CTA buttons. When it comes to your email call-to-action, use a button instead of a link. Buttons are easier to click on a touchscreen device than links. Make the button large enough for those with larger fingers to easily click and navigate to the next step in the buyers journey. More and more consumers are going mobile every day. If you want to catch the attention of this growing audience, your small business should invest in email marketing that’s optimized for mobile device users. Most small businesses are working with a limited budget, which means that they need to find the most affordable ways to reach and engage their audience. Email marketing is a cost-effective digital marketing tactic that takes very little investment to get started. Additionally, email marketing is also relatively inexpensive to maintain over time, allowing small businesses to get more for their marketing spend. It’s no surprise why so many small business owners are eager to start developing email marketing campaigns. While traditional marketing tactics like print and TV ads or direct mail can cost thousands of dollars over the course of a year, email marketing allows small businesses to reach a wide audience for just pennies per recipient. Such a significant ROI allows you to do more with less, which why email marketing is great for small businesses that are working with smaller budgets. The costs involved with email marketing are relatively few. That being said, the exact costs of your email marketing campaigns will depend on a few different factors, including what resources you have in-house. In addition to creating an email marketing strategy and identifying campaign opportunities, you will also need to decide on who will create the marketing content and implement your campaigns. If you do not have the in-house resources to develop and implement your small business email marketing campaigns, then you might consider hiring outside help. Though working with an email marketing agency does require an up-front investment, it can actually help you save more money in the long run. Working with an agency allows you to free up your own team to focus on other core business tasks. The agency will also be able to help you see better results more quickly given their experience with this tactic. If you’re considering this option, contact our team to discuss which of our email marketing plans would be best for your business. Now that you know how affordable email marketing can be for your organization, let’s talk about ROI. One of the top reasons why email marketing is so effective for small businesses is that it provides a strong return on investment. No matter how tight your small business marketing budget may be, you can still take advantage of the immense benefits that email marketing provides. Consumers who receive marketing emails tend to spend more, providing an attractive ROI for small businesses. Email marketing increases company revenue. The most obvious way that email marketing helps provide a positive ROI for small businesses is by helping to increase revenue. Email allows you to reach a wide and willing audience while also keeping costs relatively low, leading to positive revenues. Email drives more traffic to your company website. Another way that email provides a return on investment is by helping drive more traffic to your company’s website. Email subscribers are more likely to be qualified leads, which means that this traffic is relevant, increasing the chances of conversion. Email marketing can improve sales conversions. Marketing emails work well as part of your lead nurturing campaigns as they can help move leads through the marketing funnel quickly and effectively. This means that email marketing is an effective way to improve sales conversions. Email helps you improve brand awareness. Increasing visibility and building relationships with your target consumers is an important part of not only landing new sales but sustaining repeat sales over time. Email campaigns like email marketing newsletters help you build brand awareness, which contributes to sustainable growth over time. When you are working with a limited marketing budget, it’s important that you get the most for your marketing spend. Email marketing helps small businesses get a significant return on their marketing investment, no matter how limited their budget may be. Yet another one of the top benefits of email marketing for small businesses is that it integrates well with other marketing tactics. Email does not have to be used in a vacuum. Small businesses can create marketing emails to meet a variety of marketing goals and use email to support a number of other campaigns. This allows them to get the most out of their marketing spend. For example, email marketing integrates well with social media marketing. If you are running a social media contest or giveaway, you can drum up excitement for the campaign through email. Additionally, you can use email marketing to grow your social media audience by including social share buttons and CTAs within your email content. Email marketing is versatile, allowing small business owners to integrate this tactic into their other digital marketing campaigns like social media. Another way that email marketing can be integrated with other tactics is by offering your business a platform for promoting new content. Content marketing is a vital part of any digital marketing strategy as it allows your business to educate, entertain, and connect with your leads and customers. However, your content marketing is only effective if you have a way of getting your content assets in front of your leads. Email is an effective way to promote this content across your target market, allowing you to get more eyes on your content and drive more traffic back to your site. Don’t let the intricacies of email marketing hold you back from using this tactic to grow your business. Has email marketing got you scratching your head? It may be time to call in the experts! LYFE Marketing specializes in goal-focused email marketing services that help you speed up your sales cycle. To learn more about how we can help you develop and implement a killer email marketing strategy, check out our email marketing services page. Still have a question? Leave it in the comments below, and one of our experts will be happy to answer you. Of course, it’s so easy to use, almost all of the people prefer email, why not? It can save your time and its instant, by the way, thank you for your tips, I also like it.